LARGE SCALE 3D TOWER DEFENSE VIDEO GAME WITH CO-OP! 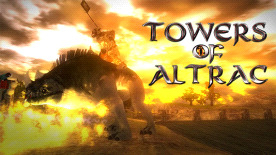 Towers of Altrac brings new features of tower defense gameplay that will appeal to players of all skill levels. The lands of Altrac are invaded by the Morkul’al and it’s up to you to defense against the enemies. The lands are divided into three folks: The Dreoks, an engineering nation of humans. The Eldran, a forrest nation and the Kal’than, a magician nation. Each nation has an own campaign to go through and free up the lands. Beautiful 3D environments, spectacular effects, dynamic weather system, day and night time cycles and a lot more bring the world to life. With the wide variety of towers, enemies and maps, a long and interesting gameplay is ensured.